At this session of the UNGA, the Special Rapporteur on the situation of human rights in the Islamic Republic of Iran, Dr. Asma Jahangir, presented her report on a range of laws, policies and practices in the country that continue to seriously undermine the fundamental rights of the people of Iran, by violating the rights to life, freedom from torture, freedoms of expression, association, peaceful assembly, and religion or belief, the right to a fair trial as well as the rights to education, health and work. The Special Rapporteur also exposed systematic patterns of discrimination based on gender, religion or belief, and belonging to an ethnic or linguistic minority.The concerns outlined in this report are a stark reminder of the persistence of chronic human rights challenges that are deeply rooted in Iranian laws, policies, and practices. 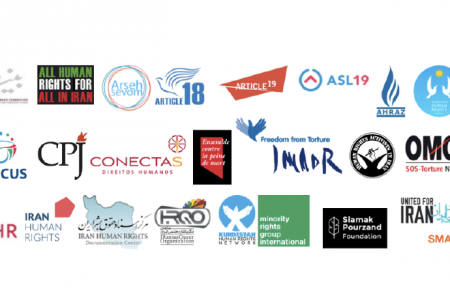 The Iranian authorities have also continued to arbitrarily detain hundreds of human rights defenders including minority activists, environmental rights activists, trade unionists, as well as journalists, political figures, online media workers for exercising their rights to freedom of expression, association, and religion or belief. In the past year, Iran has failed to seize opportunities to cooperate meaningfully with UN human rights mechanisms in order to address these challenges. The country has continued to deny independent monitoring from key human rights experts. Notwithstanding Iran’s 2002 standing invitation to the United Nations’ Special Procedures, and despite their numerous and repeated requests to visit the country, none of the 10 thematic mandate-holders who have sent a visit request have accessed the country for the past 12 years. This is also the case of the two successive country rapporteurs. Additionally, according to the UN High Commissioner for Human Rights, Mr. Zeid Ra’ad Al Hussein, the Office of the High Commissioner’s “offers to begin a technical dialogue on the death penalty have been systematically overlooked, as have all other proposals of engagement.”1 The recent High Level Political Forum was another missed opportunity as Iran eventually withdrew its participation in the Voluntary National Review of the state’s efforts to reach the Sustainable Development Goals. Iran has largely failed to engage in substantive efforts to implement recommendations made to it by the treaty bodies during recent reviews. As an example, since Iran participated in its review by the UN Committee on the Rights of the Child in January 2016, the Special Rapporteur on human rights in Iran has reported that at least nine juvenile offenders have been executed in the country, despite the Committee and other UN bodies’ repeated condemnations of Iran’s continued practice of sentencing to death and executing juvenile offenders. Iran has also made little progress on recommendations it voluntarily adopted during the second cycle of the Universal Periodic Review. 1 UN High Commissioner for Human Rights Zeid Al-Hussain, opening statement to the 33d session of the UN Human Rights Council, 13 September 2016, available at http://www.ohchr.org/EN/NewsEvents/Pages/GlobalHumanRightsUpdate.aspx.